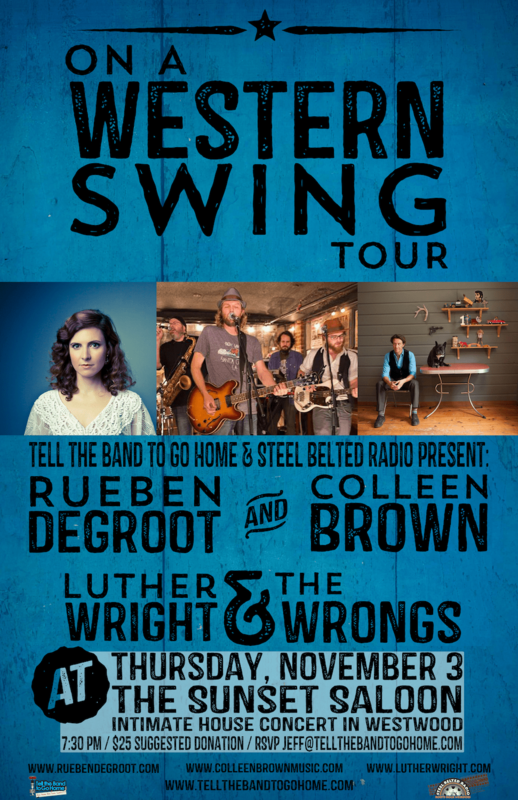 Home→Blog→Concerts→Luther Wright & The Wrongs, Rueben de Groot & Colleen Brown at Sunset Saloon, Nov. 3! Yes, THAT Luther Wright & the Wrongs! Remember that pioneering country/roots-rock combo that took the world by storm with their bluegrass version of Pink Floyd’s “The Wall?” Yeah, the one that made them big stars, had them travelling the world, recording for big labels, and even getting positive feedback from the Floyds themselves! Remember how they packed The West End Cultural Centre, wowed huge crowds at The Winnipeg Folk Festival and every other major festival in Canada? Did you know/recall that Luther was part of successful and acclaimed indie rock combo Weeping Tile, the band that launched the career of Sarah Harmer? Did you know that Luther and Sarah are pals to this day and she appears on all of his albums? Now consider how crazy it is that you can have the opportunity to see Luther and the band in the intimate confines of The Sunset Saloon with a select few of your new best friends! Sample & download some of Luther’s music here! As if that weren’t enough, we’ll also be getting a set from rising star singer/songwriter/bandleader Rueben de Groot! Rueben has released 3 CDs of his own acclaimed songs, and a brand new live CD with a band called Rocket Surgery, which was recorded during that band’s weekly residency in Toronto, but the CD was compiled and put together without Rueben’s knowledge! He’s aware now, and the world is catching on to this great performer and songwriter. His song, “Savings and Loan,” was used by Oh Susanna and Jim Bryson on the album “Namedropper,” which also featured songs by folks such as Jim Cuddy, Ron Sexsmith, Joel Plaskett, and many others? Nice company to keep!